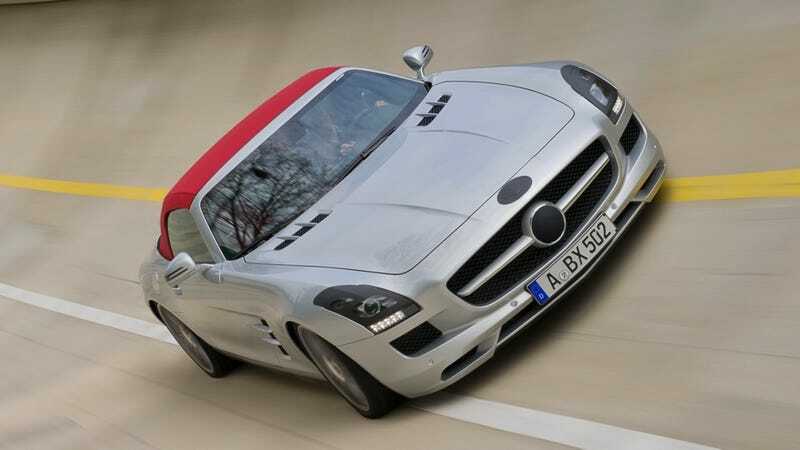 Mercedes-Benz has dropped a set of development shots of the new drop-top roadster version of the uber-awesome SLS AMG. These shots should surprise nobody as we've been seeing the SLS AMG roadster testing on the streets — and even in commercials since well before our first drive of the coupe version last year. That makes sense because although the convertible is the second car to be independently developed by AMG both the coupe and roadster were created in parallel. While the roadsters you see here are still slightly disguised we're already able to see the fabric soft top in greater detail than even in our own spy shots — which should make the hearts of old school convertible enthusiasts jump for joy. Much of the rest of the SLS AMG coupe is expected to remain the same as the roadster — so there's not much more of a story here. Still, If you — like us — can't wait to see the drop-top fully drop its top, you'll have to wait just a few months longer for its actual debut at this year's Frankfurt Motor Show.